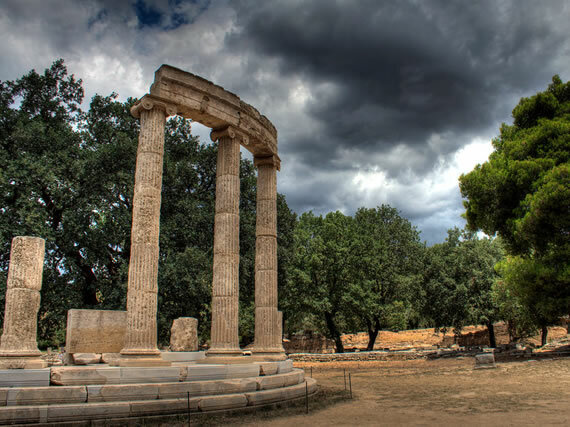 Ancient Olympia is one of the leading archaeological area in Greece. It is a natural beauty spot between two rivers, the Alpheios & the Kladeos. Olympia was never a town. It was simply a locality where, from the year 776 B.C. to 393 A.D., the Olympic Games were held every four years, in honor of the god Zeus. In NW Peloponnese, at the confluence of Alpheios & Kladeos Rivers, Olympia sits in a fertile pastoral region surrounded by wooded rolling hills. 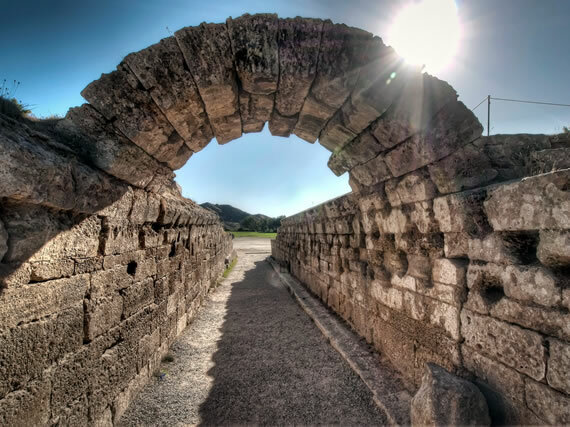 The sanctuary was constantly embellished during the thousand years of its existence to include temples, treasuries, bouleuterion, stadium, hippodrome, baths, dwellings for the priests & officials & accommodations for the pilgrims & athletes. There were thousands of altars, statues, decrees & votives in the temenos. The Altis or sacred grove, the temple of Hera, & the temple & altar of Zeus were the most important elements of the precinct. There were originally 2 & later 4 oracles. Tradition records that it was originally a place sacred to Cronus (the Mother of Gods) & Eileithyia, as well as a cult center of the hero Pelops. At some time after the end of the Late Bronze Age, the cult of Zeus was introduced & a walled sacred precinct was established. At 776 B.C. (the date marking the beginning of the historical period), the religious games were reorganized & established as the Panhellenic Olympiades. Olympia developed rapidly & the sanctity of the sanctuary & the Olympic Truce (in effect for a short period every 4 years throughout Greece to protect pilgrims) were almost never violated. In the 5th century B.C. the sanctuary reached the peak of its fame. 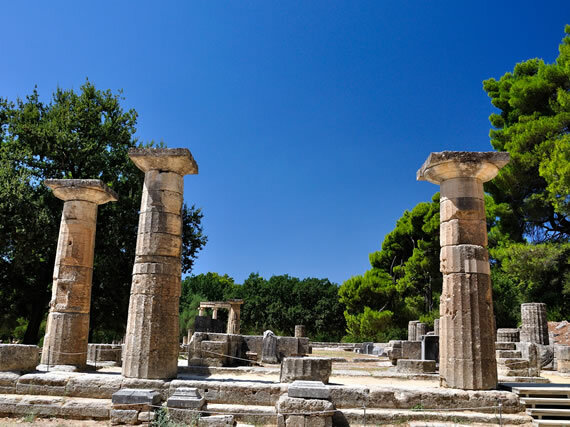 Olympia, however, remained predominantly a Greek cult center (in contrast to the Apollo sanctuaries at Delphi & Delos) & until the Roman period only Greeks were allowed to compete. At 470 - 456 B.C. the great temple of Zeus was built & housed the giant chryselephantine statue of Zeus (one of the 7 wonders of the ancient world). In 85 B.C. Silla robbed the treasuries & held the 175th Olympiada at Rome. The sanctuary recovered its games & prestige in the time of Augustus, but the games were again interrupted in 69 A.D. to accommodate Nero. The end came with the decree of Theodosius at 390 AD.